Story: This recipe is hot off the oven... just made it yesterday. There were a couple of Chinese take out boxes of white rice left over. I was looking for something quick and easy to make.. so decided on fried rice. But then I was thinking - how can we eat just fried rice. We need some gravy to go with it. Then as always - there was exploration of the fridge.. I found fresh broccoli and thought let me try Broccoli with garlic sauce in addition to the fried rice. I used to think scope creep happens only in software projects until I got into cooking! BTW the real story of 'Broccoli with Garlic Sauce' goes way back to grad school days.. (about 6 yrs ago). For any college - there is always this one thela/food stall that is open till late, serves oily, spicy but mouth-watering junk food... a fertile place for fond memories of late night "study" sessions with roommates, dinners that lasted for hours with non-sense chitchat... you get the picture. For us, Dragon Dynasty in Worcester is that place! Broccoli with garlic sauce, Curry chicken, Veg Lo Mein, Crab Rangoon... we hogged on so many favorites over the course of two years of grad school. I can no way claim that this recipe can give you the real deal.. but it did remind me of Dragon Dynasty.. and it tastes really good. I took it to work for lunch today and a couple of friends qualified it as "blogworthy".. Boil water with a little bit of salt. Blanch Broccoli florets with the hot water and keep aside. For the gravy, take Soy sauce, chili flakes, a pinch of chopped garlic, sweet and sour sauce, corn flour and water and mix really well. I just blend the mixture in a small blender. Taste the mixture and add more chili flakes or sweet and sour sauce as per your choice. Heat oil in a wok on high heat till it reaches smoking point. Turn the heat to medium, add ginger, garlic, dry red chili and 1 tsp Soy sauce and cover the lid. Let the ingredients sputter a bit for half a minute or so, add a little bit of the french onions in the mixture and mix well. Add onions, red peppers and green peppers to the wok and stir fry for 2-3 minutes. When the peppers start to sweat a little, add the gravy mixture and turn the heat up between medium and high. Mix the gravy mixture well with the peppers and onions. Add vinegar and mix well. Let the gravy thicken a bit.. as it cooks, it becomes a bit sticky because of the corn flour. Once the gravy is sticky, add Broccoli florets and mix for no more than 1/2 minute. This way the Broccoli florets stay crunchy. Add rest of the french onion and mix well. 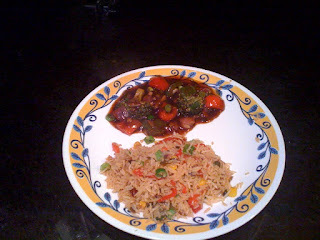 Serve hot with Chinese Fried Rice or White Rice.